The trek starts at the road head that links Chowari from Chowari Jot. Fifty metres after the last shop at Chowari Jot as you towards Chowari, a forest path bifurcates left from the metalled road and leads due east. This well maintained, two kilometres long forest trail leads through a dense forest and it is interspersed with watering points. The forest trail hugs the wooded southern side of the ridge. After two kilometres from the starting point at a well defined bifurcation leave the forest trail and scramble up a scree covered slope to the top of the ridge. Follow this ridge along the ridge line due east till you rejoin a shepherd trail. This shepherd trail, is similar to the forest trail albeit a bit narrow. 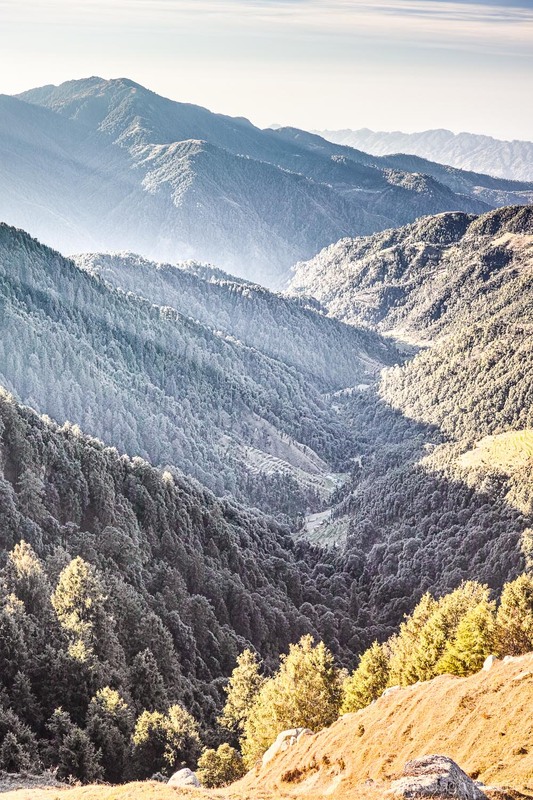 It leads through the densely forested south side, and after one and a half kilometres breaks through the forest at the ridge top near a series of boulders. From the ridge a wide well defined trail follows the ridge all the way to a shepherd shelter on a knoll. From the shepherd shelter you path descends sharply north towards Jatkari village. This sharp descent is over scree and mud and requires a bit of caution. Jatkari is a large village with a school and a village shop. This village is also linked to Chamba via a jeep-able road. 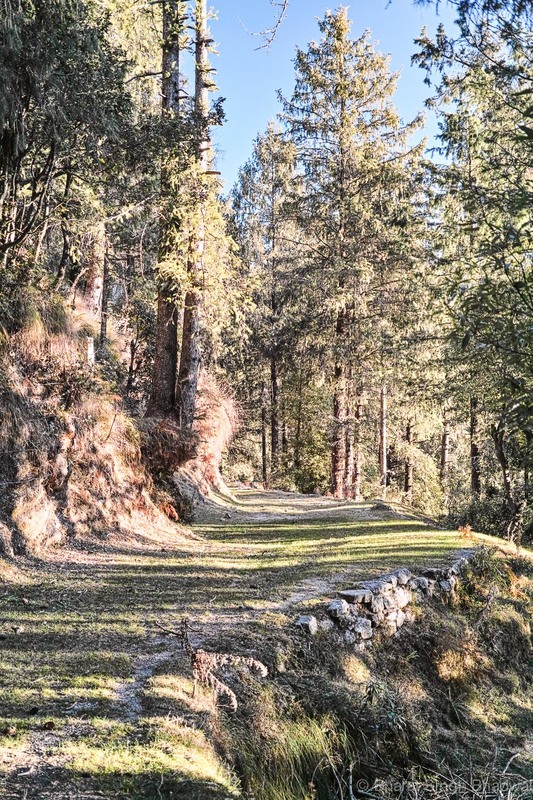 However, there is also a shorter walk way from the village that leads to Chamba and we follow this shorter route. 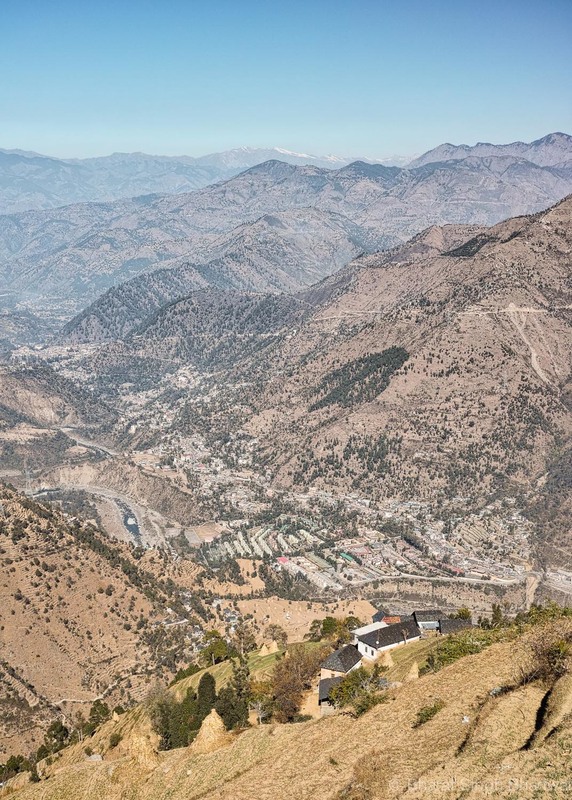 The route from Jatkari village to Chamba starts off at the village temple and the path is an extremely steep hour and a half descent over concrete and stone steps. Jatkari village temple on a knoll. The views are spectacular. 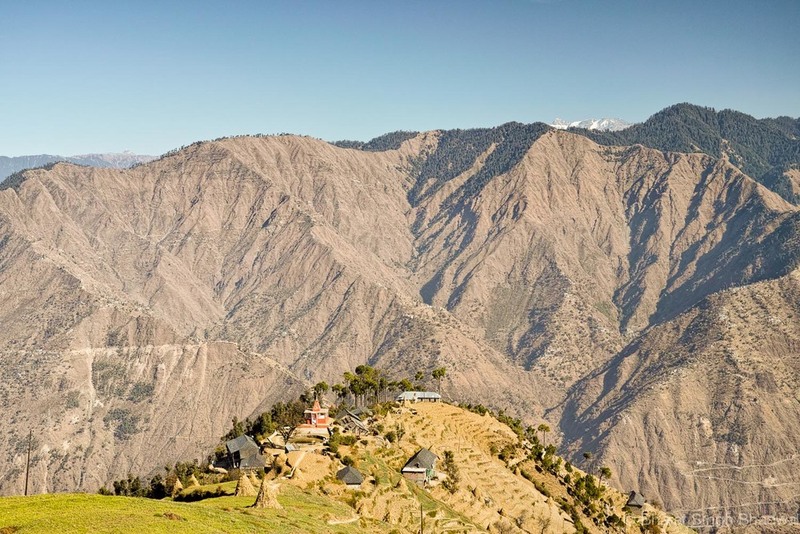 This route passes through a couple of villages along the way and the descent ends at the Bhadian village. From Bhadian village cross the Ravi River over a bridge to emerge at Chamera hydel project office at Karian. Karian is 5 kilometres from Chamba and busses leave for Chamba from Karian every 10 to 15 minutes. Buses ply regularly to Chowari Jot and Chamba. From Chamba bus stand the last HRTC (Himachal Roadways Transport Corporation) bus leaves for Chowari Jot at 1600 hours. Taxis can be rented from Chamba. A small budget hotel is situated at Chowari Jot. A couple of restaurants sell simple home cooked meals and a licensed wine shop sells Old Monk. HPTDC viewpoint shelters make excellent sheltered camping area. Chamba has hotels for every budget. A moderate trek with few steep ascends and a long, almost 2 kilometre descent first over mud and then over rock and concrete steps. Pleasant during the day till from March to November, very cold at night. CAUTION The long, hard descent from Jatkari village can take a toll on your knees. Walk in a fluid manner without locking your knees and rest frequently along the way. 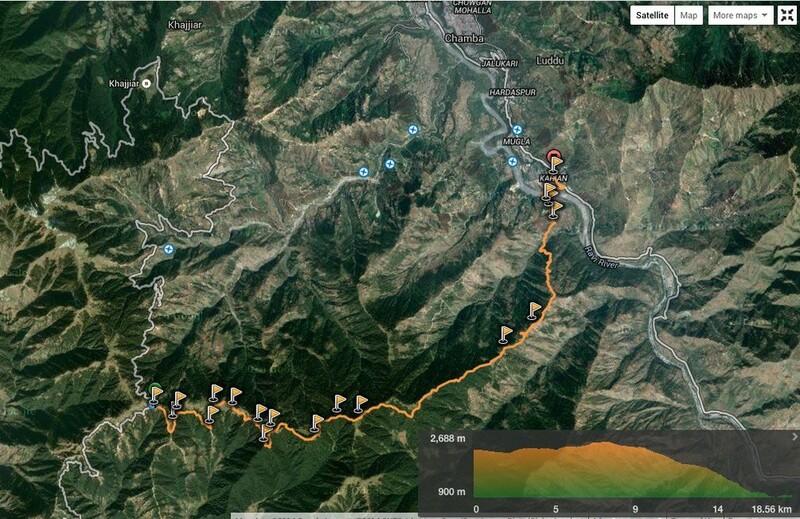 View the trekking route in Wikiloc by clicking this link.